Central Care Mission is a men’s residential Life Skills Community Center. Framed with an overall Christian worldview, program participants work to develop core Emotional, Vocational, Financial, Physical, and Spiritual life skills. We define success when participants obtain stable jobs and ongoing education, live in stable housing, own or have access to stable transportation, build new and restore broken relationships with healthy family members and positive friends, and participate in the local church and community volunteering. These powerful skills and critical outcomes transform lives, significantly reducing the probability of poverty, episodic and chronic homelessness, and addictions. In 1985, Central Church of the Nazarene in downtown Orlando felt called to respond to the homeless presence in and around their church. 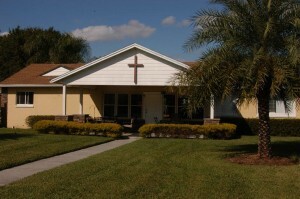 Under the leadership of Senior Pastor Jim Cummins, they began to feed the homeless out of the trunk of a car, and shortly thereafter purchased a house for feeding and housing the homeless and providing addiction rehabilitation. By 1990, the mission house had begun to outgrow the capacity of the church and no longer met county building code standards. Nathan Price, the pastor who succeeded Jim Cummins, searched for and secured a property on Lake Mann in Washington Heights that year with the help of board members Bob Hudson and Chancey Hayes. The property, formerly owned by Frontline Outreach and then named Cat Catahan House, still includes all of the buildings from that time. On February 6, 1990, Central Care Mission filed its Articles of Incorporation. The original incorporators were Nathan Price, Chairman of Board; Carol Breneman, Secretary; and Charles Kraft. The directors of the Mission have included Bill Carter, the first director; Jack Kinnett, Mike Abney, William Lowry, and Spencer Pfleiderer who is currently serving as President/CEO. Central Care Mission of Orlando, Inc. was awarded the status of a 501(c)(3) organization on July 23, 1998.